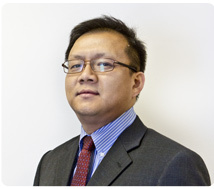 Herrick Lin oversees procurement at SB International, Inc. He is responsible for developing global strategic partnerships and relationships with all suppliers including OCTG and special metals’ products. Prior to joining SB International, Mr. Lin worked for Johnson & Johnson Worldwide Co. in the area of biomaterials and new product development. He graduated from the Beijing University and completed his MS Degree from Northwestern University in Chicago and an MBA from Fairleigh Dickinson University in New Jersey.